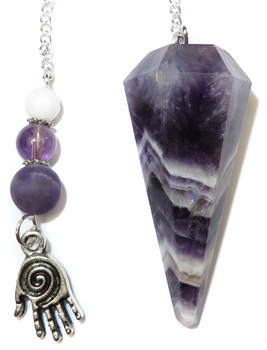 A faceted Amethyst pendulum adorned with a circular Amethyst bead, pewter spacers and a spiral healing hand charm. Comes with a velteen pouch. Amethyst: Powerful and protective stone. Guards against psychic attack, transmuting the energy into love and protecting the wearer from all types of harm, including geopathic or electromagnetic stress and ill wishes from others. Natural tranquilizer, it relieves stress and strain, soothes irritability, balances mood swings, dispels anger, rage, fear and anxiety. Alleviates sadness and grief, and dissolves negativity. Activates spiritual awareness, opens intuition and enhances psychic abilities. Has strong healing and cleansing powers. Encourages sobriety, having a sobering effect on overindulgence of alcohol, drugs or other addictions. Calms and stimulates the mind, helping you become more focused, enhancing memory and improving motivation. Assists in remembering and understanding dreams. It relieves insomnia. Encourages selflessness and spiritual wisdom. Amethyst is said to help ease headaches and releases tension. Chakra(s): Third Eye, Crown Chakra. Copyright Buy Pendulums At Wholesale. All Rights Reserved.